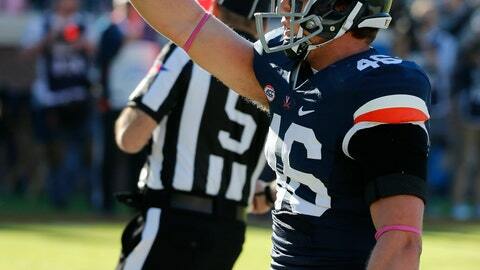 CHARLOTTESVILLE, Va. (AP) — Speedy wide receivers and a fleet-footed and mobile quarterback have sparked anticipation about Virginia’s offensive potential this season, and a lumbering tight end could also be a part of the Cavaliers‘ success. “We have a saying here, or I have a saying that he’s always open it just seems like any time you need a first down and you want to throw it,” Mendenhall said. “So Olamide’s attention with a dynamic quarterback and a downhill runner — if we expand and get a vertical threat on the outside, and then Evan is always open, it starts to make things a little more spread out defensively against us, so that’s the initial direction.